‘Optical phenomena in paintings are always considered as mistakes. Whether it is the faithfully represented, but very unusual, sunset or the bizarre arrangement of objects you sometimes find in a landscape, they are regarded as mistakes‘. This is what I said in a post, last April, in relation to reflections on water not behaving as expected. 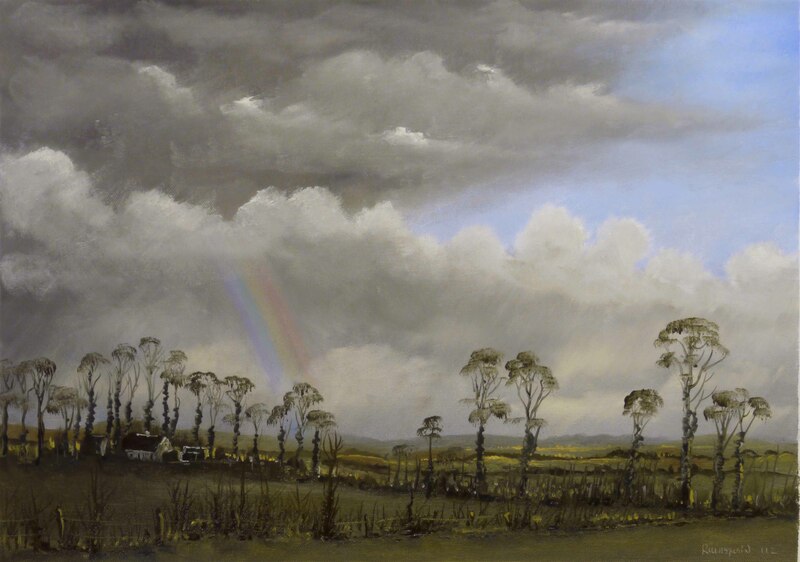 When I thought I had finished this painting, it occurred to me that the rainbow was indeed a very spectacular sight, occasionally seen. But this is valueless. The whole scene is from the imagination anyway so I could have had a leprechaun burying a pot of gold at the rainbow’s end. Anything is possible, using the imagination. I feel it is more important to portray the ordinary, or mundane, in a spectacular way. The viewer, hopefully, will appreciate the natural world a little more and not the power of the imagination of the artist. So the rainbow was reduced to an insignificant common sight, the kind we take for granted as part of the landscape. Spectacular natural phenomena are better recorded by photography, but this is losing its integrity as every photographic image is manipulated every step of the way, from the moment the shutter is released. If a photo is recorded as JPGs or TIFs the camera applies a pre-set series of algorithms to the RAW image to produce the JPG or TIF. If the image is recorded as a RAW image, the photographer has to manually manipulate the image him/herself. Here is the video. There is more information on this painting in previous post, colours, etc. As I mentioned previously, the videos are recorded as 720 HD. 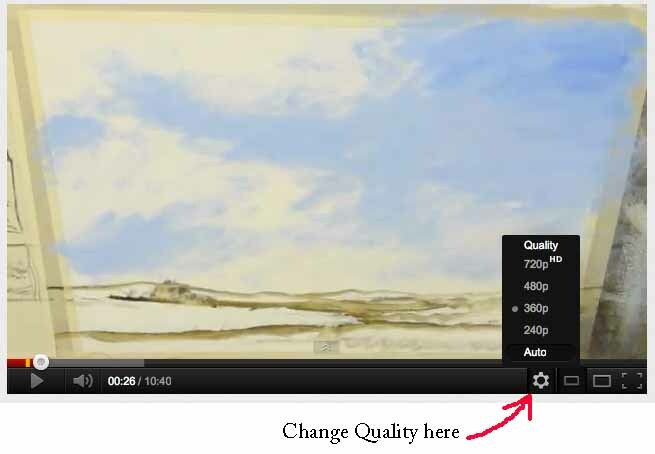 Your viewer will default to 360 low resolution on YouTube videos (for various reasons). On the bottom of the viewer screen is a setting for changing Quality settings. Very few computer users are familiar with this setting. I suppose it’s to be expected as most You Tube videos are uploaded at 360 and this option is not available. By the way the music in this video is from the 4th movement of Beethoven’s Pastoral Symphony, ‘after the storm’. Its worth watching for this, if nothing else. This entry was posted in Oil Painting and tagged Art, Culture, Education, Inspiration, Oil Painting, Oil Painting Instruction, Rainbow Painting, Time lapse painting. Bookmark the permalink.